We had a lot of tomatoes and a lot of milk. This is how ideas for dishes usually begin - there is a surplus of ingredients and I brainstorm a place for them all. 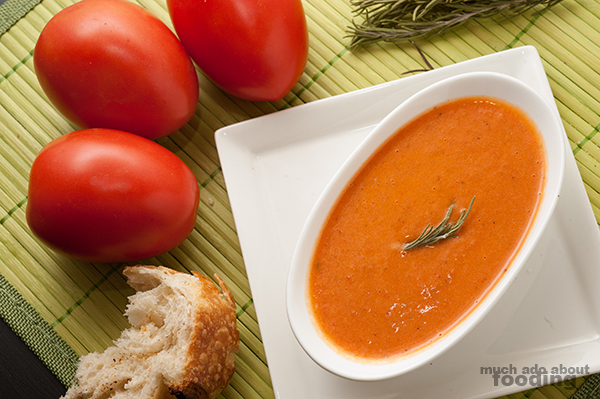 Tomato bisque jumped to mind almost instantaneously though. A common but always welcomed soup, this creamy starter is actually not too difficult to make. It's actually a great go-to for when you want a comforting dish that isn't complicated. My recipe incorporates two ways to tackle tomatoes whether you use canned or fresh; go for the fresh if you've got enough time to! If you're using fresh tomatoes, you'll work on them first by either running them through a food mill to remove the skins and seeds or blanching them to remove skins and manually removing skins. If you're using the canned tomatoes, it'll be a little easier. In a stockpot on medium heat, pour in olive oil and add rosemary and oregano when the oil is shimmery. This is to let the herbs release their oils. Then saute chopped onions until barely translucent before adding garlic and chipotle. Puree tomatoes into the onions either by pouring all into a blender or using a handheld/immersion blender directly in the pot. Add sugar, salt, and pepper. In a separate saucepan, make cream by melting butter and then adding in all the flour to make a roux. Stir to prevent lumps. Next, slowly whisk in whole milk until a smooth white cream sauce is formed. 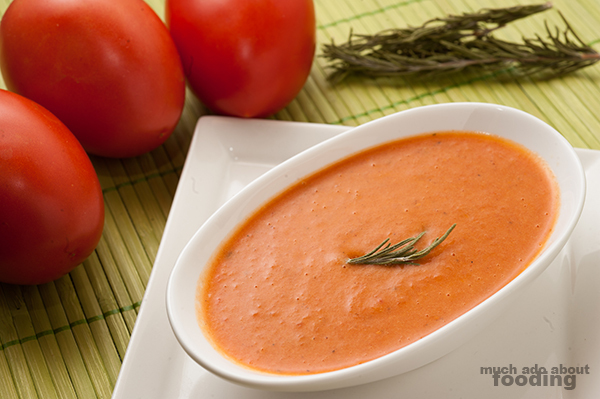 Mix cream into tomato mixture slowly and blend (with handheld blender or by pouring into a blender) until rich and smooth. Serve hot and enjoy with some crusty bread!